TORONTO, Ontario – December 15, 2015 – Keller Fay Group, an Engagement Labs (TSXV:EL) company, and creator of TalkTrack®, the leading measurement source of word of mouth (WOM) conversation, today released WOM data on the “four horsemen” of the digital economy: Apple, Facebook, Google and Amazon (collectively known as AFGA). The four horsemen are industry leaders among the tech sector and these brands have become fixtures in everyday lives. According to Keller Fay data, 18 percent of people talk about one of these four brands every day. 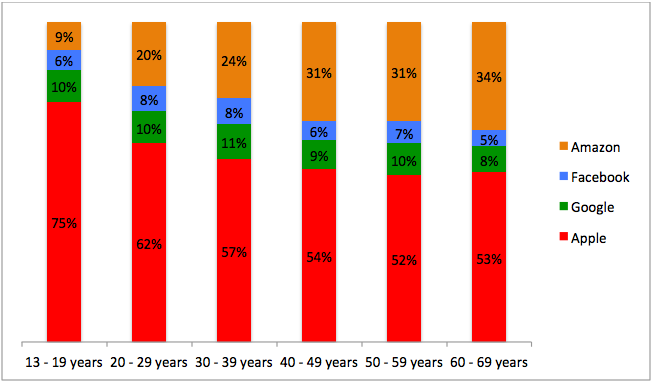 However, the demographics of who is talking about these brands vary dramatically by age. “Our research finds that one-third of all teenagers and one-quarter of all twenty year olds talk daily about one of the four brands. Now, this is not surprising given that younger demographics have a high propensity towards technology, especially within their everyday lives. On the other end of the spectrum, we found that less than one in ten fifty and sixty year olds talk about one of these brands on a daily basis,” said Ed Keller, CEO at Keller Fay and President at Engagement Labs. “Research demonstrates that consumer conversation is a huge driver of sales and revenue. In fact, two-thirds of sales come from offline conversation. Thus, having an in-depth understanding of the demographics who are talking about your brand can have a major influence on the marketing strategies that are employed to reach target audiences and drive business forward via earned media recommendation,” continued Keller. Apple comes out on top for the most talked about brand among every age group. 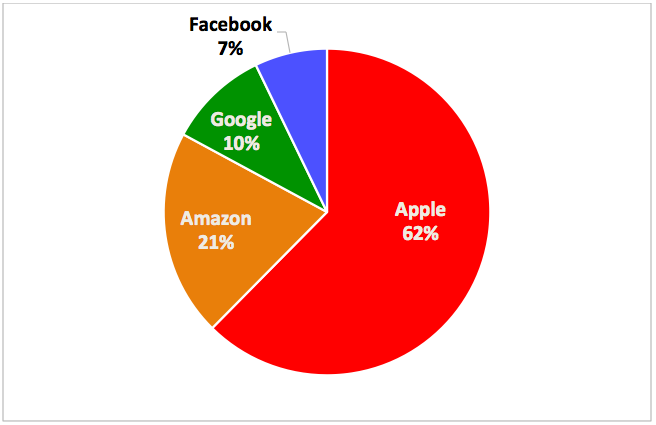 Among teens, the tech giant is the most talked about AFGA brand with 75 percent of the conversation share, while Google came in second among the teen demographic, earning 10 percent of the conversation. Even though there is an overall skew toward younger people talking about these brands in general, there are some interesting differences in share of conversations among older consumers. Among consumers over the age of 40, Amazon had a strong impact with more than three in ten of AFGA talk dedicated to the brand, which is three times the proportion Amazon received from teenagers. Though, across all generations, Amazon ranked second for the most talked about brand, which can be a contributing factor to the brand’s surge in stock value throughout 2015. Across all age demographics, Facebook was the least talked about brand with the highest percentage of WOM conversation among 20-39 year olds. Google indexed slightly higher than Facebook across all demographics with 30-39 year olds garnering the highest percentage of WOM mentions at 11 percent. Engagement Labs (TSXV:EL) offers intelligent Total SocialTM data, analytics and insights for marketers and organizations enabling them to track, measure and benchmark the conversations happening around their brand or industry both online and offline. These conversations are proven to drive critical business outcomes, including sales, while Engagement Labs’ tools provide data and actionable insight to help guide business decisions and power marketing effectiveness. Engagement Labs’ eValue™ Analytics tool is the global benchmark for social media scoring. eValue’s proprietary data technology offers real-time analysis to measure a brand’s social media and digital marketing efforts, distilling it down to a single meaningful number between 0 and 100 - an eValue score. Composed of a series of metrics and Key Performance Indicators (KPIs), an eValue score measures social media Engagement, Impact and Responsiveness which is benchmarked against 100,000+ handpicked and verified brands. The Keller Fay Group, an Engagement Labs company, is the only firm to regularly measure offline conversation, which independent research finds is a significant driver of sales with twice the impact of online conversation.